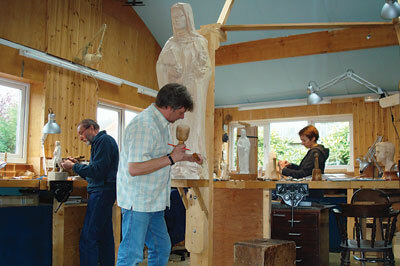 From a commercial point of view a carver's workshop differs in many ways to that of a carpenter/joiner's. One difference is that it doesn't require maximum light from all directions in the workspace. Good carving is the ability to produce forms and shapes that rely on the dynamics of shadows and cross lighting on the wood's surface that cannot be created when saturated by light. The ideal form of light for the carver is natural light from a north-facing window or skylights. This means the sun's rays seldom enter the workspace. This sort of lighting provides a uniform direction of light that is constant until the weather changes and you switch on the electric lights. For these darker moments in my workshop there is an overall backlight of independently controlled fluorescent tubes, allowing a variety of alternating backlight sources. The main artificial source of light is still made available from the same northerly direction as the natural light, but by using interior spotlights. Because I also give instruction in my studio, an allowance has to be made, so there are windows around all the walls which, when not required, may be shuttered to restrict unnecessary light entering the workplace. A carver's workbench differs greatly to that of a joiner's. It doesn't have a well - or sunken section - running along the centre of its length, so it is flat and solid to give support to large flat panels that are ready to receive carved details. Most teachers provide carving tuition in the joinery classroom of a school or college, and how many of you return home with back pain? Carvers do not like to bend their backs and the nature of their work necessitates that it is effectively executed at waist height, so a carver's bench is also higher than a joiner's. The general rule for the bench's height is 100mm, or the width of a clenched fist below the height of your elbow while standing upright with your arm bent; one metre is usually the maximum. 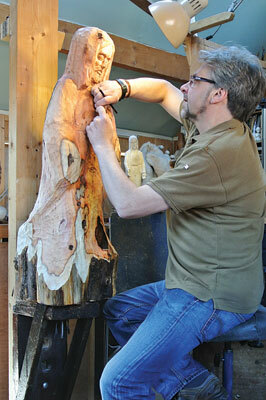 Carvers that are vertically challenged may stand on a box or block, while lofty ones have the block on the bench. So if you are using a joiner's bench, why not put blocks under the legs to lift it to the appropriate height and make it a little easier on the back? The traditional carver's post and bracket is the next most important, practical and inexpensive piece of equipment to support your work. I have two in my workshop; one that rotates vertically and one that is rigid. Both consist of a 63 x 230mm wide plank of wood that is fixed vertically from the floor to the ceiling. Onto the post, two bolts fix a wooden bracket of the same width. This may be repositioned at any height by drilling extra holes through the post as appropriate; hence it can accommodate all heights of carver. 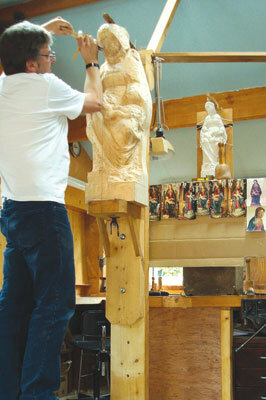 The work is secured through the top of the bracket and into the bottom of the work with a carver's screw. When the bottom bolt securing the bracket is removed, the bracket may then be rotated - secured by the top bolt - allowing access for working under the carving when it is near completion. 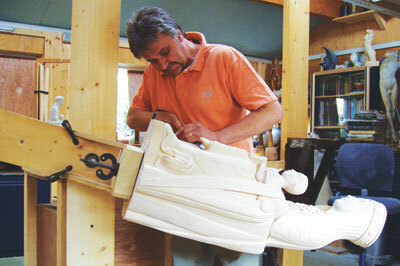 When carving larger work such as a 910mm figure or larger, the work is also held rigid by another bolt fixed through the post into the back of the carving block. Obviously ensure the hole created by the bolt is in waste timber and doesn't enter into the work or this will result in having to plug the hole. Because our procedures mean we never work around the back of the carving initially, the extra fixing doesn't interfere with the working process and gives further rigidity to larger work. When the front view of the work has been found, the bolt may be removed and the carving process can continue by rotating the work on the carver's screw.